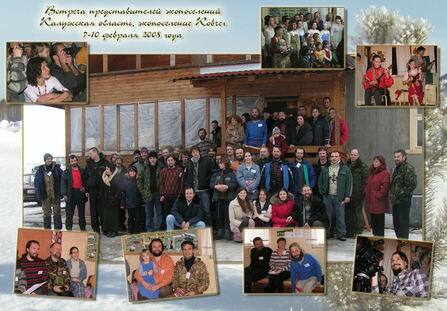 February 7-10 in Russian Ecovillage "Kovcheg" meeting of functioning ecovillages took part. Kovcheg is one of biggest one (~100 permanent residents with children currently, ~250 residents totally), so this is enough convenient place for winter meeting. Where was more than 40 participants (~50 with children) from Russia (Ural, Karelia, Central Russia), Byelorussia, Czechia and Slovakia. The are represent 16 ecovillages. Main idea was to invite representatives from functioning ecovillages. We have boom of ecovillage organizations here during last 5 years and there are hundreds of initiatives and active groups, but commonly they are solve question "How to create ecovillage?" (this is not so easy :). Main focus of our last meeting was "Problems and solutions of functioning ecovillages". Functioning ecovillages was calculated by winter permanent population (in number of families). Russia is unique country :) we found we have ecovillages with more than 40 houses under roof without winter permanent residents(!). Sometimes snow clean-up for several kilometers required from eco-village to federal roads, so winter leaving is not so toilless. This and other problems commonly solved after several families resettlement and this is questions of soon years (we take up dynamic of current functioning ecovillages population). There was several GEN members on meeting - "Novo-Ecovil" ecovillage, "Bolshoy Kamen" (Big Stone) ecovillage, "Grishino" (AFAIR - GEN-Russia members). Also GEN-Europe Council member - Laysan Mirzagitova took part in meeting and hope she will prepare detailed message in English.